The instant blame on Russia for the poisoning of Sergei and Yulia Skripal, or “highly likely” it was Russia, as Theresa May put it, proved grossly premature, graduating onto maybe not so likely at all – thanks to dedicated alt media and social media researchers and activists uncovering the development of Novichoks in multiple countries, making it entirely plausible that some country other than Russia may be responsible for the improbably Salisbury event. No sooner did the Skripal Affair wind up, that another supposed ‘chemical attack’ unfold, this time in Syria, where an alleged chemical weapons airstrike was said to have taken place in Douma on 7 April. Accounts of this incident were reliant entirely for its evidence on two dubious sources, the US and UK-backed White Helmets and the Syrian American Medical Society (SAMS). It didn’t take long before the official story started springing leaks though. The hilarity of seeing chlorine cylinders laying on a bed, rather than smashing through it, numerous witness statements there was no chemical attack, the testimony of over a dozen medical personnel at the medical centre concerned that the White Helmets caused a panic by shouting chemical attack when there was none and the interview of 11 year old Hassan Diab, who was not a chemical weapon victim, but certainly was a victim of an unwarranted drenching as part of a staged event, have all demolished yet another false flag instigated by western intelligence agencies and their White Helmets operatives. All this was irrelevant however to the criminal Troika, the US, UK and France, who bypassed the United Nations and bombed Syria in the early hours of 14 April, provoking Russia into an instant reaction which never came. Some are of the opinion that the Troika and Russia reached an agreement beforehand and so therefore there was never the threat of outbreak of conflict which could escalate to a catastrophic WWIII. Faced with rapidly dwindling legitimacy and credibility, the UK government in particular set their attack dogs in the mainstream media on to alt media and social media activists. The result is a coordinated and intensive smear campaign against independent journalists, academics and social media activists with large followings. The gutter press of the UK have demonstrated that in terms of propaganda and disinformation, they are without peer. US media Russophobes almost look like babes in the woods in comparison. What we are witnessing is a war on truth, vicious intimidation of dissenting voices, the negating of fierce independent voices as Russian puppets and bots and Assad apologists, and ad hominem attacks all designed to shut down a powerful narrative which shines a light on the warmongering narrative propagated by the mainstream media. The campaign reached a level of absurdity beyond comprehension when Twitter activist @Ian56789 was asked by Sky News hosts if he was a bot as he was being interviewed live on air! As disinformation against Russia soars off the fake news Richter Scale and independent journalists and activists are being personally targeted, one only has to revisit the recent Devon Nunes Memo story as an example of a real domestic US political scandal which the derelict US mainstream media attempted to transform into yet another Russian disinformation campaign. You would have to be living under a rock to not know of the salacious, but unverified dossier on US President Donald Trump, which purportedly started out as a piece of opposition research during the 2016 election campaign, but quickly became the driving force behind allegations that Trump colluded with the Russian government in order to win the presidential election. In the mind of many a deep state adoring Democrat and mainstream media journalist, it is beyond dispute that Trump colluded with Russia. The major questions are how extensive the collusion was and does it amount to having committed federal crimes. To answer these questions, the Mueller investigation must continue expanding as far and wide as necessary. Many Republicans believe the widely ridiculed and discredited dossier prepared by a former British spy, Christopher Steele, was the catalyst for the FBI decision to investigate allegations of Trump campaign collusion with Russia. A mocked and debunked dossier, which looked like it was concocted in a teenagers bedroom bought down on CNN and Buzzfeed a truck load of embarrassment when they decided to run with a story other media outlets balked at. So how did it transform into such a vital document that initiated the Mueller probe into suspected Trump collusion with Russia? We have had the mainstream media pumping this story 24/7. They will not let it go, determined that it bring about the downfall of Donald Trump. By gleefully accepting any lead from their highly coveted ‘sources’, the MSM begs to be subverted by the intelligence community, thereby subverting any prospect of a properly functioning US democracy and informed citizenry. However, the revelations of #ReleaseTheMemo which alleged shocking FISA abuses by the FBI has raised the spectre of another alleged collusion; the FBI and the Obama DOJ colluding against Trump. The major accusation is that the FBI hid from the FISA court judge the fact that it was heavily relying on the dodgy Trump Dossier to obtain a surveillance warrant to spy on Trump, the man who was to become the future President. What is even more explosive is that it was not revealed to the judge that the Democratic National Committee and Hillary Clinton’s presidential campaign paid for the dossier. Dirty partisan politics has gone a step too far in this sordid affair, with the DNC and FBI duping the FISA court into unwittingly assisting them in their campaign against Trump. And let’s be clear here; this is the work of the Obama administration and any rigorous investigation would pursue whether or not the collusion against Trump went all the way to former president Obama himself. Republicans were outraged and demanded the release of the memo. This is hardly a surprise, being shocked and alarmed at possible internal interference in the election by US intelligence agencies, the very agencies that told us it was Russia that undermined US democracy by its electoral interference. It is crucial to grasp the fact that this affair is a case of internal interference in the election campaign and has generated intense reaction within the US political establishment and among many in the general public. One may question then the spin the Hamilton 68 propaganda organ placed on the interest whipped up by the memo. It attempted to reframe calls to release the memo as yet another so-called Russian influence operation, using trolls and bots to amplify the message across cyberspace. 'Hamilton 68' doesn't track propaganda. It is propaganda. Its "Council"? Stuffed with Bill Kristol, Michael Chertoff, Mike Morell, etc. Its funding? Opaque (see its 990s). Its methodology? Unfalsifiable–Twitter users put on ad-hoc secret lists based on political view. Appalling. Hamilton 68, a banal and comical operation, is projecting on to Russia the very thing it is doing itself; spreading disinformation aimed at undermining and destabilizing Russia, but also the US political system. On the strength of CNN’s dumpster diving, Hamilton 68 likes to tell us all about how the cryptic ‘Internet Research Agency’ in St. Petersburg is one big giant troll factory. Sorry, Hamilton 68, but you are one big NATO/Deep state cyberspace troll factory yourselves. “… Several Twitter hashtags, including #ReleaseTheMemo, calling for release of these talking points attacking the Mueller investigation were born in the hours after the Committee vote. According to the German Marshall Fund’s Alliance for Securing Democracy, this effort gained the immediate attention and assistance of social media accounts linked to Russian influence operations. By Friday, January 19, 2018, the #ReleaseTheMemo hashtag was “the top trending hashtag among Twitter accounts believed to be operated by Kremlin-linked groups.” Its use had “increased by 286,700 percent” and was being used “100 times more than any other hashtag” by accounts linked to Russian influence campaigns. These accounts are also promoting an offer by WikiLeaks to pay up to $1 million to anyone who leaks this classified partisan memo. Nice sleight of hand Hamilton 68, Schiff and Feinstein, but this is a scandal that whipped Republicans, not Russians into a frenzy. It is a stand-alone scandal that raised questions about the ethics, partiality and possible illegal acts of the US intelligence community and the Obama DOJ. It does not need any Russian trolls to inflate the gravity of the situation. Yesterday, I viewed a deeply troubling report compiled by House Intelligence that raises questions about Obama DOJ & the so-called collusion investigation. Joining @foxandfriends in a few minutes to discuss why this report needs to be released to the American people ASAP. Desantis said it right there: collusion between the Obama DOJ and the FBI. If true, it is a shocking indictment on deep state interference in US politics, going all the way to the top in attempting to subvert the US presidential election. So we have at least 2 allegations of collusion; the longstanding and tiresome Russiagate story, which the mainstream media will not give a moments rest and the newer, but equally shocking FBI/DOJ collusion emerging from the woodworks with the news of the classified memo. You can read and watch RussiaGate stories in both US/Western MSM and Russian media. Fair enough, it was a big story, newsworthy and deeply concerning if it was true (the US media has overplayed their hand though to put it mildly). As time goes on and without a shred of evidence produced, it is time to put the whole issue to bed and move on. It is only the absurdity of the MSM insistence that collusion has been proved beyond doubt and any who question it are conspiracy theorists, that maintains the interest of the reasonable person, even if only to mock media figures and politicians who are the true conspiracy theorists. The calls to release the Devon Nunes compiled memo also attracted huge coverage in both US and Russian media. However, US media framed it in terms of a partisan struggle between Democrats and Republicans; detracting from the implications of the abuse of the FISA system and placing the scandal into the realm of normal everyday, if somewhat dirty party politics. There is nothing everyday about the possibility that this whole Russia investigation is in reality a conspiracy by top FBI officials and the DOJ to sabotage Trump and install Hillary Clinton (remember her?) as president. Look at Peter Strzok and Lisa Page as examples, whose texts made no secret of their contempt for Trump and their desire to see him lose the election. So why did CNN, the New York Times and the supposedly reputable Business Insider deem it newsworthy to claim Russian influence networks were spreading the release the memo hashtag like wildfire across the social media landscape. Business Insider even implied the Nunes memo has been given wings by being amplified by Russian trolls and bots across the social media landscape. The compiling of the memo by Republican aides on the House Intelligence Committee that led to the unfolding scandal was not initiated by Russia. The angry calls for action came from Republicans, not Russians. We can’t even be sure if these so-called Russian networks of trolls are Russian at all. But let’s assume for a minute they are. Big deal if they spread the story. It is fascinating, very interesting and could have huge consequences of DOJ and FBI heads rolling. It also serves to relieve some of the pressure on Russia, so why wouldn’t they promote it heavily. They are merely acting in the interests of Russia, which no reasonable person could complain about. So a media figure from NBC is clearly muddying the waters, throwing us a red herring in implying the nefarious hand of Russia is at play. Maddow gave Dilanian huge impetus in his attempt to try to flip the story to turn it into yet another opportunity to attack Russia. Deeply troubling allegations which could rock the foundations of the intelligence and justice communities are made a mockery of by a disreputable journalist who sees it as another chance to Russia bait. Before you know it, they will be telling us the #Memo was a joint venture put together by the FSB and Republicans, thus proving the collusion is still going as strong as ever. This level of hysteria is way beyond Cold War McCarthyism. And when Rachel Maddow retweets something, how many likes and retweets does that generate. Enough to turn the Russian bots and trolls green (or should that be red) with envy. Maddow herself is capitalizing very nicely on the Russophobia being generated by the whole Russiagate affair to boost her own ratings and affection within the political establishment. She has not got a single progressive bone in her body and epitomizes the dumbed down, hyped up claims about Russian interference in American political and social life. The spectacle is the theatre of the absurd, as Americans are subjected to Hollywood type entertainment to titillate and shock with the never ending “revelations” which roll out like clockwork. And, true to Hollywood style fiction, the more outrageous and sensational the better. This is why Maddow is able to get away with calling Jill Stein a Kremlin puppet, and to feign seriousness and solemnity as she continues to call Trump a Putin puppet, putty in his hands, even as Trump has clearly embarked on a path which has plummeted US/Russian relations to their lowest point since the darkest days of the Cold War. Maddow uses a technique for these claims which may enthral Never-Trumpers and fill Le Resistance with fear, but it is straight from the neocon playbook. It is that any sign of Trump not being totally committed to overt and outright hostility to Russia proves that he is a Russian puppet. He must adopt the neocon attitude of Russia being the eternal enemy, the biggest threat the US faces and that it must be confronted and made to pay a price for its aggression, expansionist ambitions and meddling in US affairs. Putin has Trump in a vice like grip with the “compromat” on him, using it to blackmail him in to doing Russia’s biddings according to Maddow. Putin is forcing Trump to declare war on the intelligence community, fomenting chaos in a crowning glory of undermining US national security. How better to leave the US vulnerable to the rapacious desires of Russia than by shattering the institutions of US national security. Maddow believes Putin blackmailed Trump with the Golden showers tape to hire Paul Manafort as his campaign manager, to hire Rex Tillerson as Secretary of State, and to pressure him to withdraw US forces in Eastern Europe and the Baltics, (which hasn’t happened). In Maddows demented mind, anything less than the Trump administration universally standing poised to unsheathe their swords and land a mortal blow on Russia is proof of collusion with the Kremlin. Any conciliatory overtures are met by howls of derision by the Maddow/Hillary Clinton led “resistance.” Amid this red hot rhetoric and witch hunt for internal traitors, Maddow and her ilk are the ones to claim it is Russia sowing discord and discontent. “This is international warfare against our country,” Maddow said on her show. ‘If it proves to be true.’ That’s right, and we’re still waiting for the evidence. Maddow and her fellow military industrial complex media mouthpieces don’t need evidence to believe Russia interfered in the election, as she spreads her poison to millions of viewers night after night. She sees Vladimir Putin as pure evil, the embodiment of the terrifying KGB and tells her viewers this repeatedly. She has become the torchbearer for an ever wilder conspiracy theory, whipping her audience into a frenzy, baying for Russian blood. It is extraordinary that anyone listens to a word Maddow says after she produced her only evidence on Trump; his tax return which revealed he paid $38million in federal taxes on more than $150 million in income in 2005. 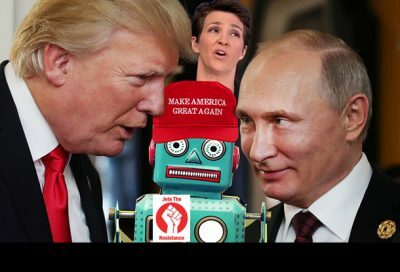 Bombing out big time on alleged Trump tax cheating has clearly not stopped Maddow proceeding full steam ahead in accusing him of being a Kremlin installed puppet. So who is running an influence campaign here, Moscow, or the US military industrial complex media? What is never discussed outside of alt-media circles is how far were the FBI, the DOJ, and the Hillary Clinton campaign involved in what is increasingly looking every day more like FBIgate than Russiagate? What about the roles of powerful deep state actors like John Brennan and James Clapper, who are bound to have played a hand in concocting and promoting the official conspiracy theory? Clapper, who thinks it is in Russian DNA to hack things and Brennan who sees Russia as a long term threat intent on attacking US democracy, sternly warning the incoming President Trump not to ignore the huge threat Russia poses. At this point, the $64 question is whether the various congressional oversight committees will remain ensconced in their customarily cozy role as “overlook” committees, or whether they will have the courage to attempt to carry out their Constitutional duty. The latter course would mean confronting a powerful Deep State and its large toolbox of well-practiced retaliatory techniques, including J. Edgar Hoover-style blackmail on steroids, enabled by electronic surveillance of just about everything and everyone. Yes, today’s technology permits blanket collection, and “Collect Everything” has become the motto. The take-away from all of this is that no sin is too great, and no scandal can’t be flipped to pin the blame on Russia. Meanwhile, any criminal or unethical conduct of Democrats and deep staters will not be plastered across the newspapers and cyberspace. Don’t worry about it. Just say its Russian disinformation. Works every time.